“Sir, my concern is not whether God is on our side; the greatest concern is to be on God’s side, for God is always right.” Abraham Lincoln was hesitant to claim divine righteousness for his cause, but that humility is tougher to find among the World War II allies in 1962’s The Longest Day. 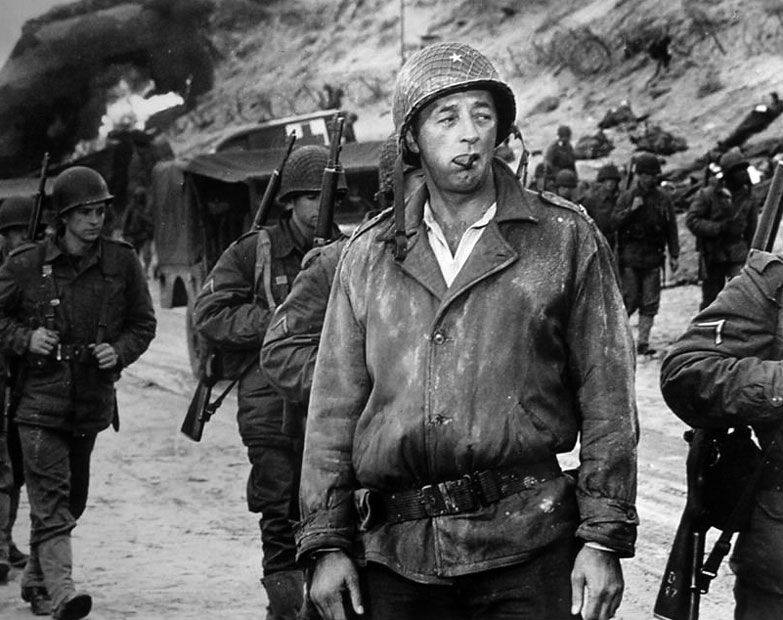 Sure, when weather didn’t cooperate for the D-Day Invasion, Lt. Col. Benjamin Vandervoort (played by John Wayne) said, “Sometimes I wonder whose side God’s on,” but you can tell he doesn’t really doubt that God opposes the Nazis. 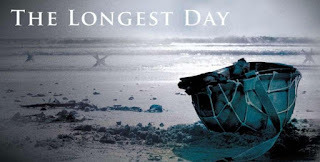 The Longest Day is the true story of the Normandy invasion, with a screenplay by Cornelius Ryan based on his nonfiction book of the same name. His book reports on the story from a wide range of sources, including General Dwight Eisenhower and his command staff, paratroopers, members of the French Resistance, and even those on the German side. Since it’s one of those “cast of thousands” movies, I’m on shaky ground including it as a Robert Mitchum film for Mitchum month. 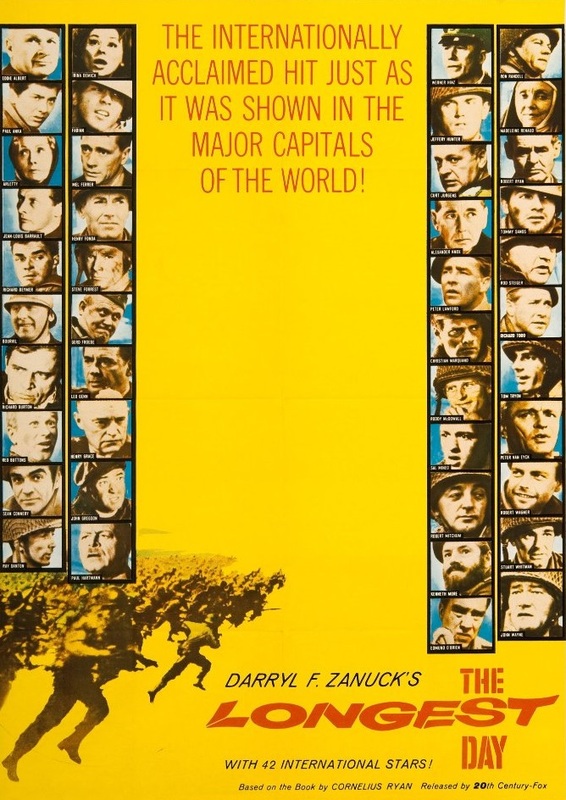 There’s Henry Fonda as Teddy Roosevelt Jr. and Peter Lawford as Lord Lovat and Richard Burton and Fabian and Paul Anka and Sal Mineo and Sean Connery and Red Buttons and Eddie Albert and Roddy McDowell and Rod Steiger and George Segal and Tommy Sands… lots of people. But it’s Mitchum who plays Brig. General Norman Cota, the soldier who makes a climatic breakthrough off the beach up to the mainland. 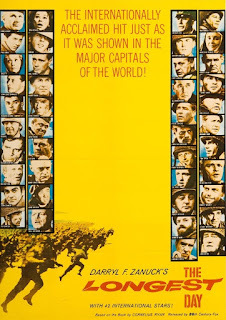 Mitchum is one of the three stars (with John Wayne and Henry Fonda) featured in many of the advertising posters. Even as a star, though, Mitchum has only about fifteen minutes of screen time in the three hour film. Clergy have even less screen time, playing little cameos from one minute to, at the most, five minutes, but there’s enough of interest for us here at Movie Churches. 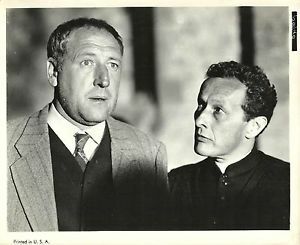 First of all, there is Father Louis Roulland (Jean-Louis Barrault), a French priest in the city of Sainte-Mere-Eglise, occupied by the Germans. He’s a fictional character who, I assume, Ryan intended to represent real clergy in occupied France. In the film, he preaches to his congregation that “in our darkest hour we must trust in our unshakable belief that liberation will come.” He preaches this with a German officer in the congregation, which signals a special kind of bravery, chutzpah, or stupidity. This same priest, at the time of the invasion, alerts the mayor to the presence of Allied paratroopers, urging people to their aid. 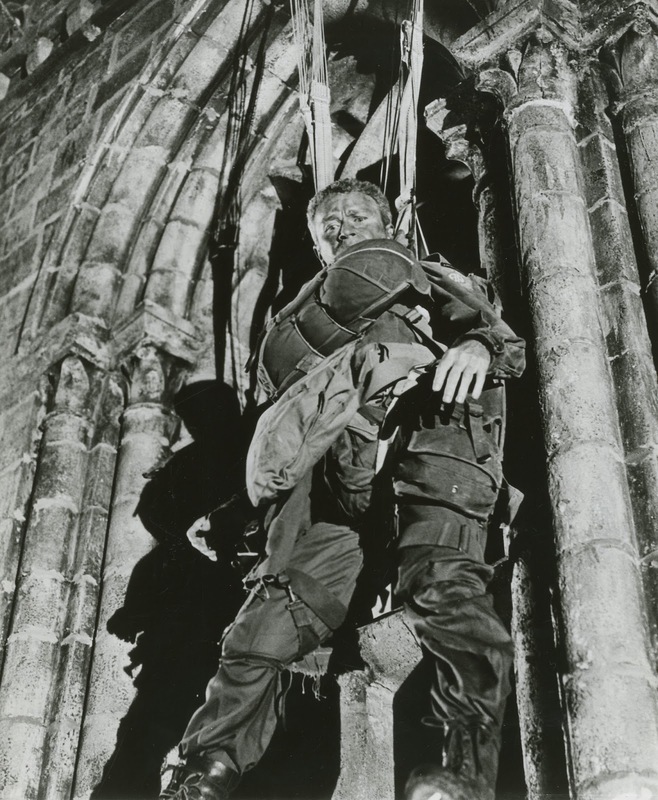 In a true story (I remember it from the book), one of the paratroopers landed on the church, his parachute caught on the bell tower. He remained there for hours, the ringing of the bells rendering him deaf for days. The soldier said, “Who isn’t? 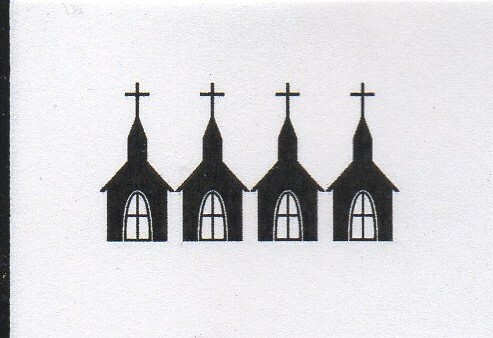 Come with me.” I was impressed by clergy who were willing to be lost and in grave danger to be with the troops. 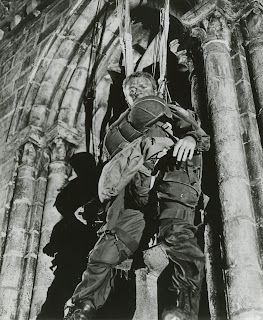 The most impressive impressive clergy in the film, though, are a group of nuns who boldly walked through Sainte-Mere-Eglise as battle raged. When they got to a building where the Allied wounded were, an officer asked them what they were doing. The officer replied, rather redundantly, “But this is a battle!” The nuns seemed to be quite aware of this fact and set to work. 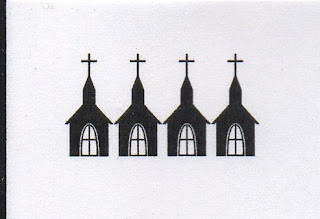 Among the cast of thousands, God’s workers stand out in the film, earning the Church in the film Movie Church’s highest rating of Four Steeples.